You might have noticed that I missed posting any recipe last week and I have my usual excuse of busy schedule to blame on...at least I feel relieved after pointing that out... phew... I almost thought this week would pass by the same way without any post, which was apprehensive for the blogger in me. Since every blogger in the blogsphere were posting Diwali (Indian festival of lights) and Halloween recipes, I couldn't let the occasion slip out without a recipe. So I decided to make a super easy dessert which can be prepared within 15 - 20 minutes and tastes super delicious. You can add a black M&Ms on top of the ladoos to transform it into a spooky eyeball Halloween treat!!! The normal coconut ladoo recipe only uses desiccated/grated coconut, but I wanted to uplift the taste by adding some nuts to it. Since I always have almonds in my pantry, I didn't have to think twice as my family loves them. I knew that I can use them blind folded in these ladoos. My hubby couldn't stop eating them while I was rolling them. I had to hide the rest of the ladoos for the photo shoot which I did today, since the whole ladoo idea came at night and it was already late to do any styling or photography. I am glad that I went with my urge to make these yesterday night, so that I could post it today for the Halloween and for those you are preparing for Diwali. Have a Spooktacular and safe Halloween!!! Happy Diwali to all who celebrates the festival of light!!!! 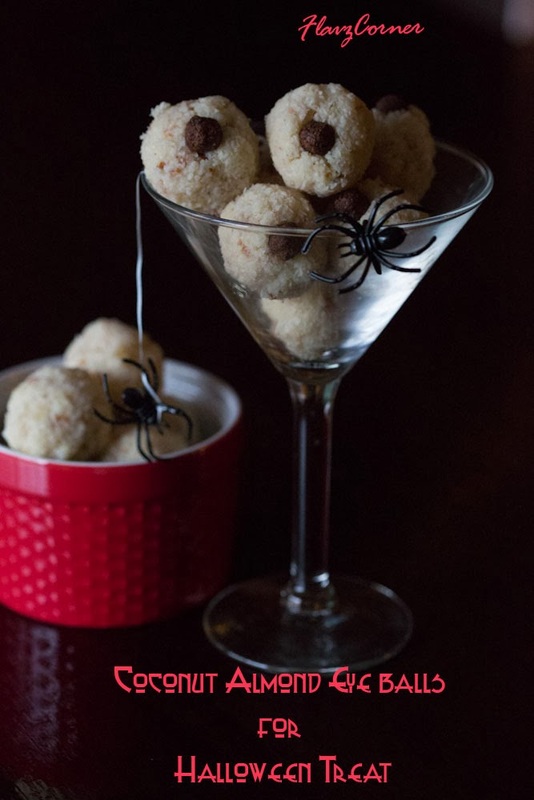 Here is the recipe for Coconut Almond ladoos for Diwali or a eyeball Halloween treat!!! Got to get ready before kids shows up for trick or treat...Enjoy!!! Melt 1 tsp of ghee in a non stick pan. Add the desiccated coconut and crushed almond and toast on low heat for 2 - 3 minutes. Ensure that you use low heat so it the coconut will not turn into brown. Add the milk powder and mix well. 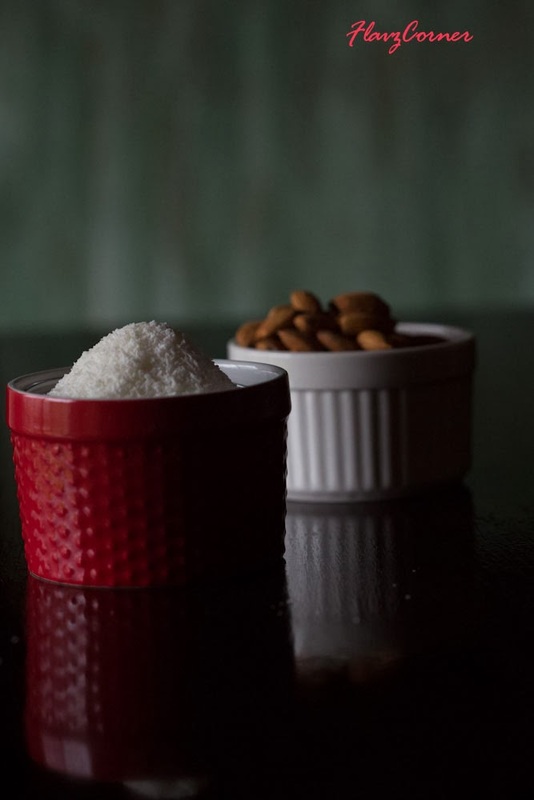 Now pour the condensed milk into the coconut almond mix and combine well. Add 1/2 cup of milk and mix well till the mix starts to stick together. Add the cardamom powder and mix well and turn off the burner. Wait for 5 - 6 minutes or till the mix is still warm but can be handled. Take 1 1/2 tbsp mix for each ladoo and roll small balls with the mix while it is warm. Store them in air tight container after cooling. Dry roast the almonds on very low flame for 5 minutes and let them cool. Use a mortar & pestle to crush them. I didn't powder them as I wanted to have the crunch in the ladoos. Use dessicated coconut or the coconut powder you get from Indian stores which are not fine powder but coarsely powdered to make the ladoos. If using fresh grated coconut, make sure to dry up the moisture by dry roasting the grated coconut, this may tend to lose the white color of the ladoos. You can refrigerate the ladoos for a week in air tight containers, but trust me, it will not last for a week since its highly volatile. Yes, I loved the almond crunch in it. Thanks Anupa for thecomment!!! Go ahead and try it Rafeeda, I am sure you gonna love it!!!!! 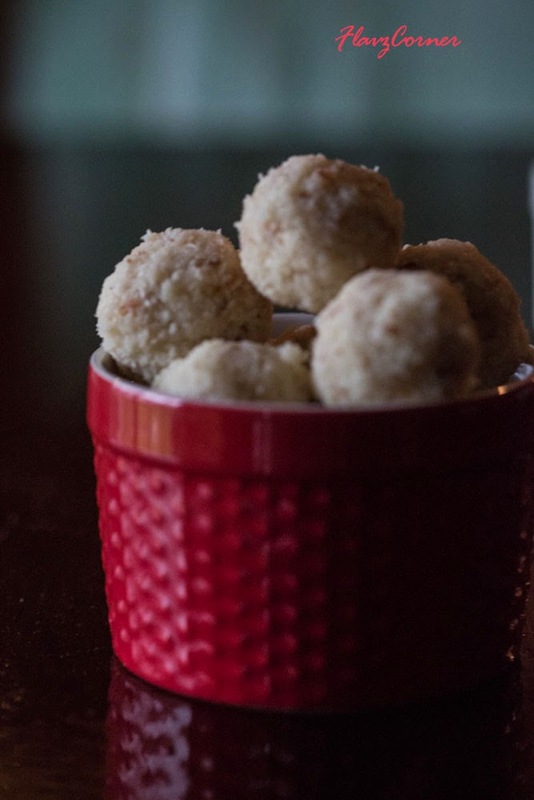 I"ve never made ladoos - they look terrific! And coconut? One of my fave flavors! Really nice - thanks so much. 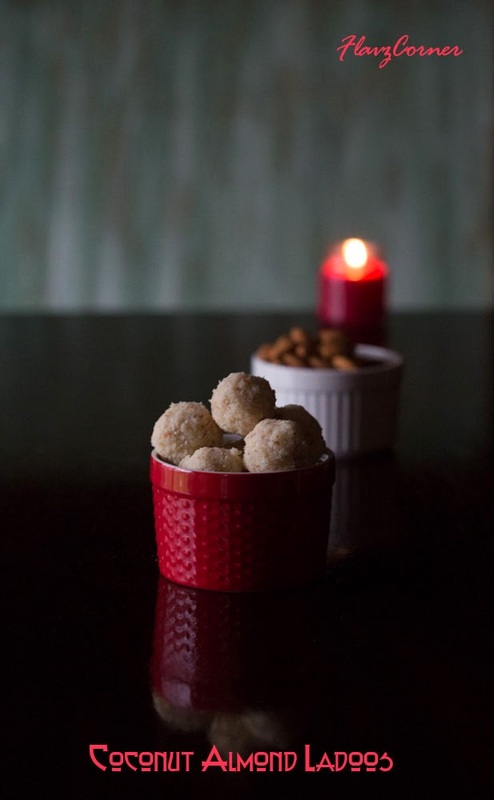 Love coconut ladoos and the addition of almonds is only making them more tempting. Glad you posted this week - I adore ladoos - if you put a plate of ladoos in front of me, they will be gone in 10 seconds! And these sound so delish - love the coconut milk/condensed milk combo - so yum! Loving these droolicious laddos, Shibi!